I can take care of the music. Should be fun! I know you can pull this off. Hope your weekend is restful. This caused me to laugh hysterically. But—mysteriously—we did somehow pull it off. And we even had a big audience to witness this miracle! My roles were storyteller, puppeteer, and also Godmother Drosselmeyer. In our version of the story, Godmother Drosselmeyer presents a special present for the Stahlbaum children and their guests: a wonderful puppet show! 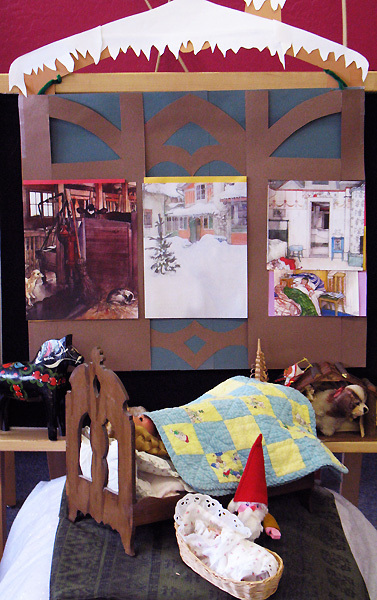 We brought my childhood puppet theatre to the library, and that really did add to the magic! The unicorn puppets performed a twining, sinuous dance to the Arabian Dance music, which we moved from its normal position in the ballet. We also added some other seasonal music, since Linda’s harp arrangement did not include much of the music from Act I. Linda played The Holly and the Ivy for the decorating and lighting of the Christmas tree, and the Wexford Carol for the arrival of the guests. She played Tomorrow Shall Be My Dancing Day for the arrival of Godmother Drosselmeyer and the distribution of presents. We used the March for the magical growth of the Christmas tree and battle between the Nutcracker and the Mouse King. …and it grew some more..
…until it became colossal…like this! Then Linda donned her crown. She was the Sugar Plum Fairy! She welcomed everyone to the Kingdom of Sweets, and invited everyone to enjoy the entertainments she had planned in honor of the Prince’s victorious return. and the Waltz of the Flowers (the finale with the entire audience dancing with garlands of candy flowers). Our page, Pauline, had given me a big bag of Tootsie Pop Miniatures after Halloween, but I knew that the parents would kill me, so I put them aside for another occasion. What could be more perfect to transform into candy flowers? …and the children were delighted to dance with them! When the dance was finished, I cut the garlands apart and added the flower candies to tiny treat bags of candy. I taped a Nutcracker cut from an old paper garland to each mini-bag, and filled them with Tootsie Pop Miniatures, miniature candy canes, and peppermint and cinnamon hard candies. The kids were thrilled to receive their special treats! What a marvelous time we all had in the Kingdom of Sweets! Or was it just a beautiful dream? For our Cool After School program the day after the winter solstice, I read Lucia and the Light, by Phyllis Root and illustrated by Mary Grandpré. It’s a new story, told in the style of a folk tale. I introduced it by telling the children how the sun seems to rise farther and farther to the north as the days shorten, and people in the far north feared that the sun would finally disappear, taking away all its light and warmth. The solstices mark the two points in the year when the sun seems to stop moving, rising in the same position for a couple of days before beginning to move back in the opposite direction. I told them that when I lived much farther north, the days began lengthening noticeably right after the winter solstice, a welcome reassurance that spring would eventually arrive. Lucia lives in a cabin in the far North with her mother and her baby brother, their cow, and her milk-white cat. One winter, the sun completely disappears, and Lucia goes on a quest (accompanied by the milk-white cat) to find it. After the story, we made origami sun wheels. 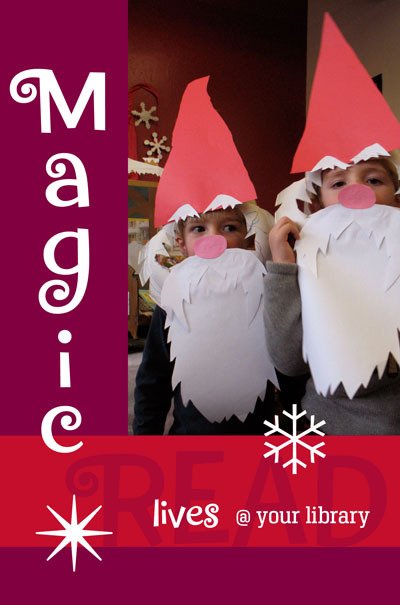 The magic of the season arrived with a flourish this week! We had the first snow of the winter at our house on Beethoven’s birthday. I was up late making a Tomten puppet, and it was easy to imagine a tomten making little footprints in the silent snow outside our frosty window. 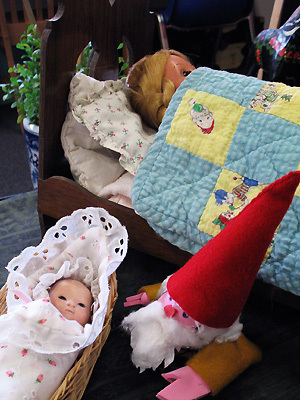 The next day, the children loved wearing their Tomten masks, and they delighted everyone who was lucky enough to see the little gnomes tiptoeing through the library. On Saturday, Linda and I had our final concert (of three!) this week, and we had an amazing crowd of over 60 people crammed into the children’s library. I was ecstatic to see so many parents and kids from the community in attendance. 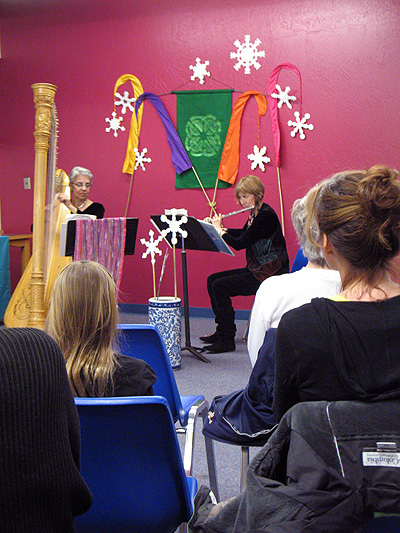 Linda and I played our best, and it was thrilling to feel the current of warmth flowing from the audience. I told my own holiday version of “The Button.” It includes Mouse Children who come Yule caroling in the winter, Maying in the spring, and playing Button Button, Who Has the Button? in the fall. When we were making the Mouse masks, I had asked parents if they thought their children might like to have a part in our holiday concert. But of course it’s hard to know how children will feel about things when faced with an audience, so I was prepared to tell my story without the participation of Mouse Children. Imagine, then, my joy when a number of children arrived carrying their Mouse masks! And there were many eager volunteers for the three extra masks I had with me! Finally, thanks to my friend Bob Kanegis, I had the perfect opening for my story of Simple Gifts—the Global Heart Warming ritual that he invented. The Tomten, by Astrid Lindgren and illustrated by Harald Wiberg, was the featured book for this week’s Page Presents class. I love it. It’s a quiet, magical tale from Sweden about a tomten (gnome) who watches over a farm and its inhabitants at night. It is not a Christmas story, but the Tompten’s red hat and white beard—and the wintry setting—make it feel right for the season. The Tomten’s gentle way of caring for all the creatures of the farm serves as an antidote to the frantic consumerism of the holidays. Quiet magic. We could all use more of that in our lives. and reassures them that warm weather will soon return. Then he visits Caro the dog, who looks forward to nightly visits from his friend. The Tomten sees that Caro is cold, and he brings more straw to tuck him in so he can sleep. 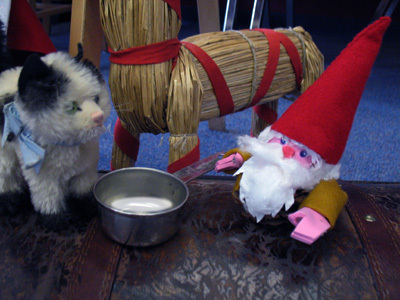 Then the Tomten goes into the house and visits the sleeping parents and children. He gazes at the children and thinks, “If they would only wake up, I would talk to them in tomten language, a silent little language that children can understand. But they are always asleep.” The Tomten is a very old tomten, who has lived at the farm for generations. But none of the humans has ever seen him. But people will always need stories. Of course you can stay with me, and of course I will give you milk. And everyone settles into a deep and peaceful sleep in the winter night. All but one, who is watching to make sure that all is well. Afterwards, the kids made Tomten masks. Since they are still rather small people, they made the library seem like quite a magical place! Mr. Matt translated the Swedish children’s Christmas song, Tomtarnas Julnatt, and then taught us a simpler version. The little tomtar feast upon the goodies that have been left out for them on Christmas night. We sang all the verses and tiptoed in a circle, pretending to be tomtar making our rounds on a cold winter night. My husband Stuart was reading Beethoven’s Hair: An Extraordinary Odyssey and a Scientific Mystery Solved, by Russell Martin. (And raving about it, too, by the way.) It is an extraordinary tale, and I’m dying to read it now. Beethoven’s hair survived for DNA testing because it was well sealed in a frame by one of its owners, and then it narrowly survived incineration by the Nazis. DNA and physical analysis of the hair revealed much about Beethoven’s physical condition, thus answering many questions that have persisted since his death. Anyway, he (Stuart) needed a haircut, but he wanted me to take a photo of him with the book first. That’s when we discovered that Stuart is Ludwig’s Doppelgänger. Then he decided that he didn’t want a haircut after all. Long before Facebook, with its birthday reminders, all of my musician friends tended to remember my birthday, because it’s close to Beethoven’s. So I would get lots of birthday greetings on Beethoven’s birthday, December 16th. As a matter of fact, my birthday was yesterday, the 15th, and I was lucky enough to be playing concerts Tuesday and yesterday…along with another one coming up on Saturday. I told my musical partner, Linda, that getting to play music with her is the best birthday present I could wish for. I love the way my latest READ poster turned out, and this is a good time of year to be reminded of Beethoven’s prediction in his Ninth Symphony: Alle Menschen werden Brüder (All mankind become brothers). This December, that prediction feels just as far distant as it must have seemed to Beethoven in 1824 when he penned these words for his final complete symphony. But Beethoven’s music—and Music itself—will always keep the hope alive. I was planning a story-time featuring polar bears, and had already settled on which books to use when someone put this book, Cold Paws, Warm Heart, by Madeleine Floyd, on my desk. I was quickly flipping through it, when it opened to an image of a large polar bear playing a silver flute! We had already made polar bear masks with my Page Presents class, so this became the featured book for my Movement & Music class for toddlers when I discovered that I could play my flute under the mask. Last week I repeated the program for a mothers’ group that had requested a special story-time for their kids. Only three kids and their moms showed up, and none of the kids were happy to be there. One boy started repeating, “I want to go home!” When none of them wanted to play the chimes, I knew I was doomed, because kids ALWAYS want to play the chimes. But I tried my best to carry on with the story-time, and began reading Cold Paws. The last thing I saw before donning the polar bear mask was the grumpy kids clinging to their mothers. Behind the mask, I couldn’t really see anything, and I just concentrated on playing the sad little tune of the lonely bear. But, oh my! When I pushed the mask up off my face, I was surrounded at close range by a ring of about 8 kids. And they were all leaning forward! Like the cold bear in the story, I finally felt completely warm inside. A great book to pair with Cold Paws, Warm Heart is No Bath for Boris, by Diana White. It is—may I say— the polar opposite. While the bear in Cold Paws is cold and wants to be warm, Boris and his Mama love the cold. The faucets on the bathtub are marked, “Cold” and “Colder,” and Mama throws in some ice cubes and opens the window so the cold air can blow in. She tells Boris to get out of the tub before the water gets warm, and hands him some towels fresh from the fridge. Delicious! And the illustrations in pale polar colors perfectly capture the comfort and playfulness between the wayward little bear and his mama. 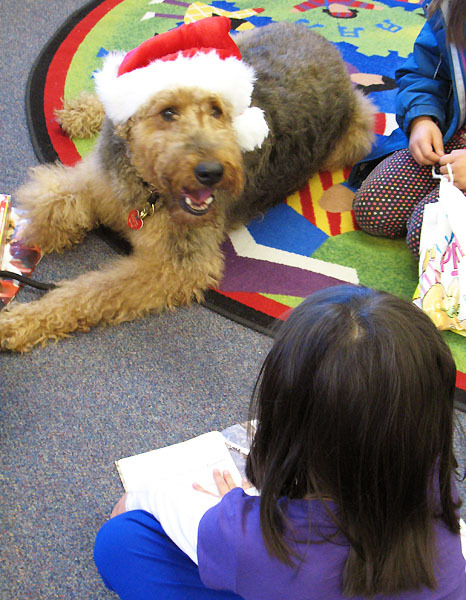 Our monthly Read to the Dogs program was on Saturday, and Harry Potter the Airedale Terrier was wearing his Santa hat! What a mellow boy. All of his regular fans were there, plus some new friends. My teen volunteer, Gregoria, had made two displays of dog books, including one with holiday books featuring dogs. One shy little girl had been hanging out with Harry Potter, but had resisted all requests to read to him. I asked her if she had seen the displays of dog books, because I was pretty sure she would find something that Harry would like. As soon as she saw the display she reached for Ivan the Terrier, by Peter Catalanotto. “I think I could read this,” she confided. When I went off to lunch, she was happily reading to an appreciative Harry. Music & Movement: Snow Parade! This week we had a Snow Parade at our Movement & Music storytime! Inspired by the book, The Snow Parade, by Barbara Brenner and illustrated by Mary Tara O’Keefe, I made some large snowflakes from white poster board. I attached four of these to large colorful flags that I had, and made large snowflake wands with six others, for a total of ten. In the book, Andrew Barclay wants to have a snow parade, but his sister and brother both reject the idea. So Andrew goes outside and starts marching in his own private snow parade. Along the way, he encounters various curious animals who wonder what he is doing and then opine that a parade needs more participants. So he invites them to join in the parade. The borders of the pages gradually fill with snowflakes, as an additional snowflake appears for each new participant. The kids were eager to join the snow parade, and parents joined in, too. With a beautiful smile, an elderly grandfather accepted the snowflake wand that was made from a cane and marched in the parade with his grandsons. Before the parade, we played rhythm instruments along with “Good King Wenceslas” and “Patapan” by Mannheim Steamroller. After finishing with a round of “Head, Shoulders, Knees, and Toes” and our goodbye song, we had to have another Snow Parade! This week’s Cool After School program featured The Tale of Two Bad Mice, by Beatrix Potter. I wanted the kids to see the same story presented in three different media. First, I showed them the book and gave them a synopsis of the story as told in the book. I showed them the book illustrations and asked them to watch for similarities and differences in how the story was visually presented through print, puppetry, and ballet. Then I repeated my puppet show version of the story that I had created for the Page Presents program. My puppet show includes the dolls, Lucinda and Jane, but does not include the thefts by Tom Thumb and Hunca Munca. Like the ballet, it includes a dance before the scene at the dining room table. Although I used Johann Strauss’ Pizzicato Polka for the dance the last time I presented the puppet show, this time the mice danced (briefly) to the electric sounds of Mannheim Steamroller. This incongruity with the period flavor of the rest of the production tickled the audience. 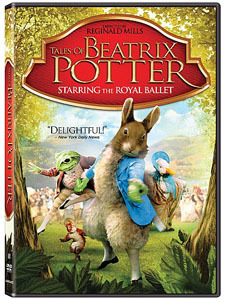 Next we watched a version from The Tales of Beatrix Potter, by England’s Royal Ballet. Beatrix Potter’s original watercolor illustrations spring magically to life through choreography by Frederick Ashton, a musical score by John Lanchbery, and costume design by Christine Edzard with masks by Rostislav Douboujinsky—as you can see in this clip advertising a current production at London’s Royal Opera House. The ballet version does not include the dolls, but has a hilariously extended sequence of the mice smashing the plates of doll house food. I was a little worried that the kids might become restive (especially for ballet!). But they watched intently, making occasional comments as they recognized various elements of the story. I fast-forwarded through a couple of dance sequences, and afterwards they all wanted to know what they had missed! Several of the kids had seen The Nutcracker ballet, and I heard comments like, “Oh, I love ballet!” In any case, all of them were thrilled to make their own mouse masks. Unfortunately, I didn’t have my camera with me to record the splendid results. While searching for a good image from the ballet, I ran across a lengthy Wikipedia entry on The Tale of the Two Bad Mice, which includes a fascinating account of the development of the story. It includes a photograph of the doll house that Norman Warne built for his niece Winifred, which served as a model for the doll house in Beatrix Potter’s story. 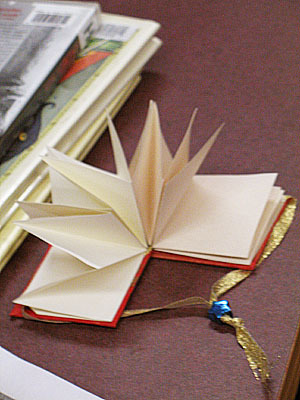 The December Origami Cool Zone at the Tony Hillerman Library featured star boxes and star books! First we made star boxes. 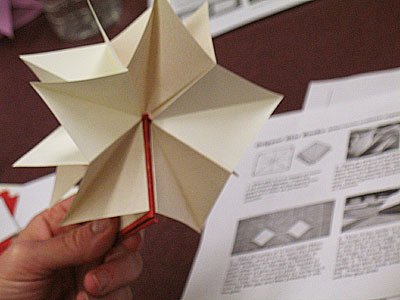 This was good practice for the star books, since they also begin with a square base. After everyone had mastered the star box, we made a star book. I found some beautiful marbled paper at the art supply store. Some people didn’t even believe that it was actually paper, which just goes to show you that we should teach more workshops on book-binding! 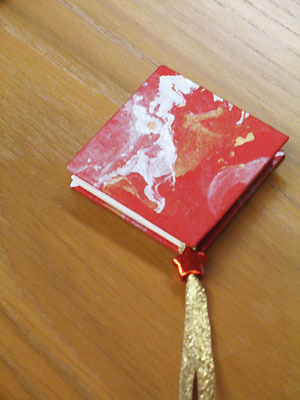 Star books make impressive gifts, but they are surprisingly easy to make. In the photos below, you can see how well everyone’s star boxes and star books turned out!